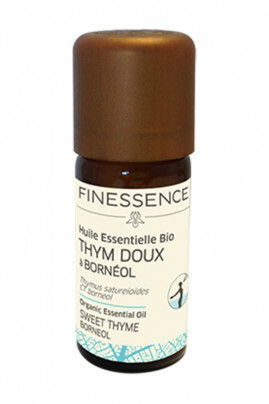 Finessence Organic Sweet Thyme Borneol is recommended for its broad-spectrum anti-infectious properties. Ideal for winter periods, it is very effective against viral and bacterial infections. It boosts immunity and helps cure ailments faster. Used in invigorating massage, it brings energy and tone to the body as well as to the spirit. In atmospheric diffusion, the Finessence Organic Sweet Thyme Borneol cleans the air of your interior and promotes breathing. Tonic, it creates a fresh and invigorating atmosphere. How to use Organic Sweet Thyme Borneol? Atmospheric diffusion: Pour a few drops of essential oil into your diffuser. For broadcast time and dosage, follow the instructions for use of your device. Respiratory Massage: Pour 4 drops of essential oil for 1 teaspoon of vegetable oil of your choice. Infusion: Dilute 3 to 4 drops of organic essential oil in honey or a piece of sugar. Mix in one liter of lukewarm water. A natural and organic concentrate of Borneol thyme! Dangerous. Comply with precautions for use. Flammable liquid and vapour. May be fatal if swallowed and enters airways. Cause severe skin burns and eye damage. May cause an allergic skin reaction. Toxic to aquatic life with long-lasting effects.